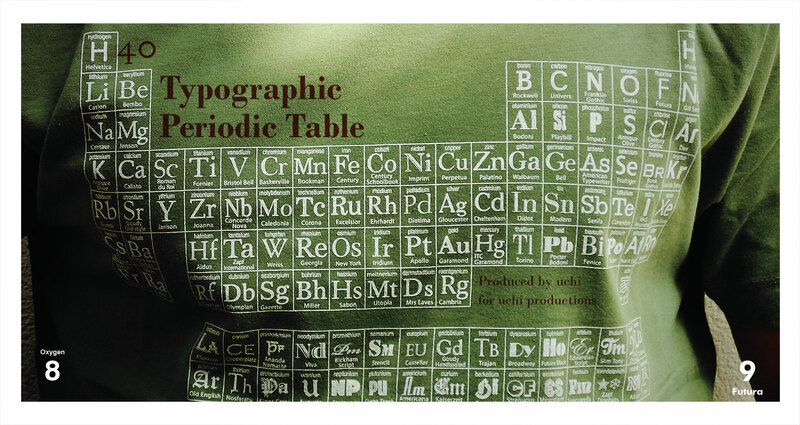 uchi’s Periodic Table — a brief description of each typeface group. 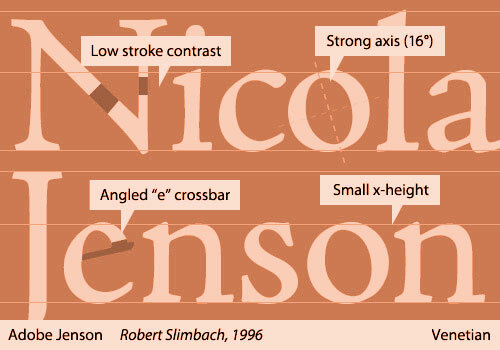 There are many styles of type and many classification systems – defined by their visual characteristics (stroke contrast, serif shape, etc) and their historical development or reference. 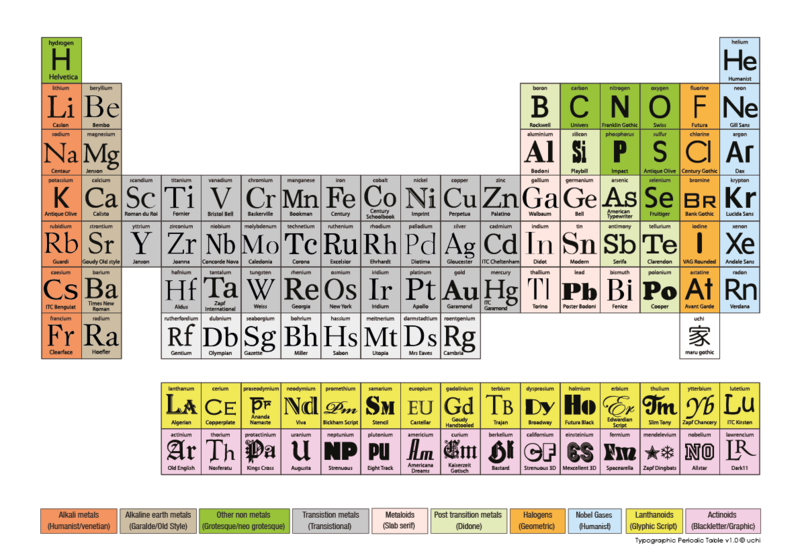 Here, I’ve tried to match typefaces over the ages into their main classifications within the element groups on the Periodic Table. Also, except for the Lanthanoids and Actinoids (Glyphic, Script, Blackletter and Graphic faces) and, where possible, in each element group, the typefaces are in roughly in date order from the top to bottom. There are some notable exceptions for aesthetic reasons. 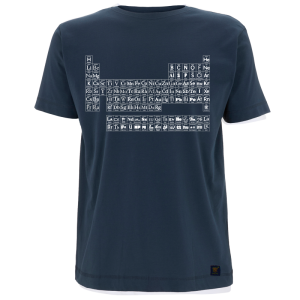 For example, Helevtica, which was made in 1957, had to be Hydrogen! Want to know your serif from your slab-serif? 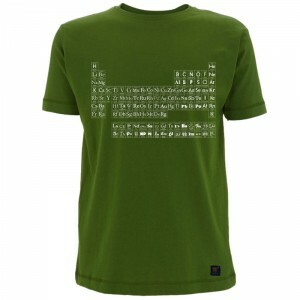 Read on for a description of each type style. 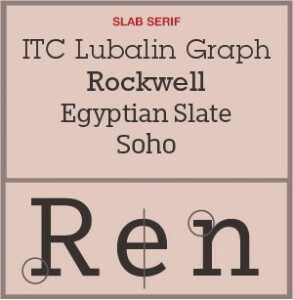 Characteristics: Bracketed serifs which are angled on lower case letters and ascenders, curve axis slopes to the left, little contrast between thick and thin strokes. 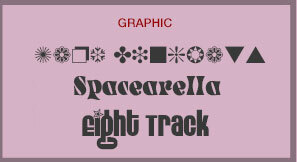 Characteristics: Bracketed serifs, curve axis slopes to the left, heavier contrast between thick and thin strokes. 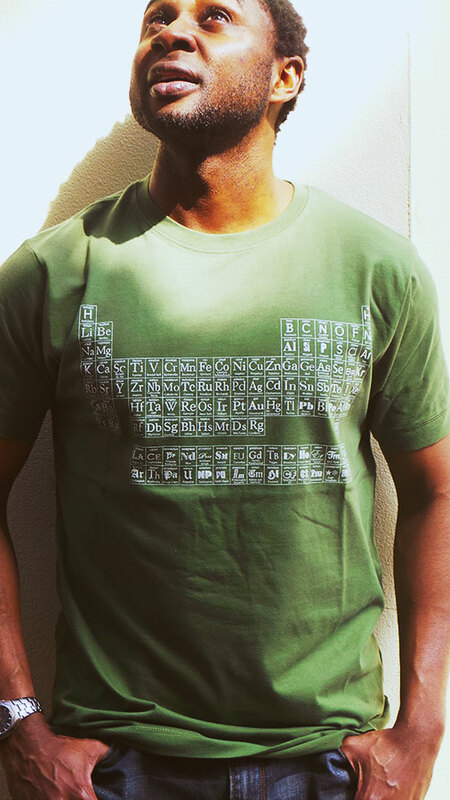 The lower case e has a horizontal bar. 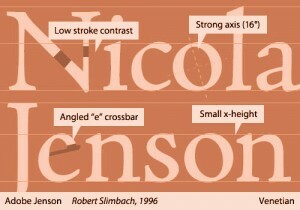 Characteristics: No serifs. Slightly squared curves. 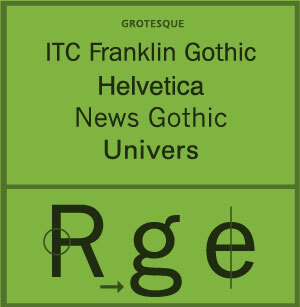 Grotesque faces have more contrast between thin and thick strokes than the latter more uniform neo grotesque fonts (Helvetica). Characteristics: Bracketed serifs which are angled on ascenders and lower case letters, vertical or left inclined axis on curves. 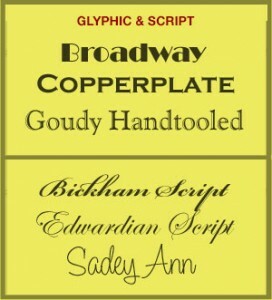 Influenced by copperplate engraving. 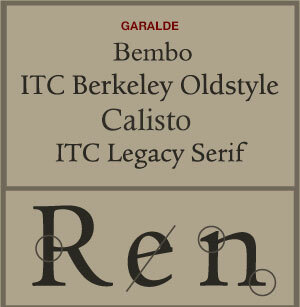 Transitional typefaces incorporate characteristics of the earlier Garalde and the latter Didone type. 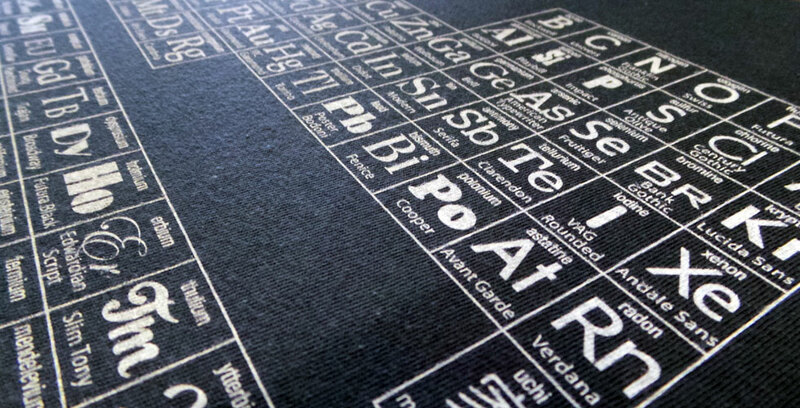 Characteristics: Typefaces with heavy, square-ended serifs, often the same thickness as the main stem of the letters. 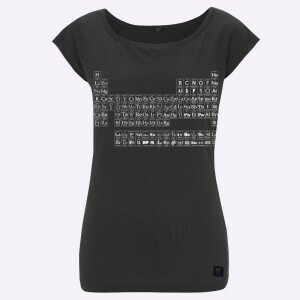 Serifs can be with or without brackets. 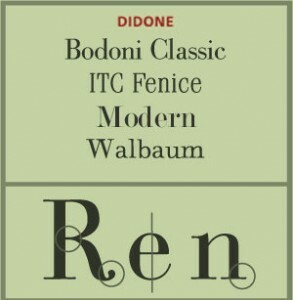 Characteristics: Didone faces feature strong and abrupt contrast between thick and thin strokes. 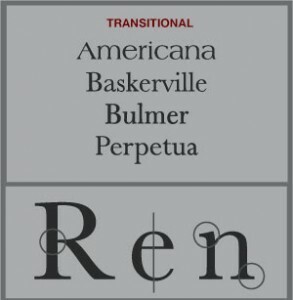 Curve axis are vertical and the lower case serifs of ascenders are generally horizontal. Generally there are no bracketing of serifs. 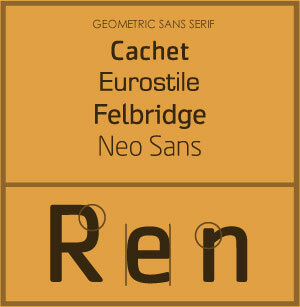 Characteristics: Geometric fonts are of uniform weight and based on simple geometric shapes, rectangles and circles. 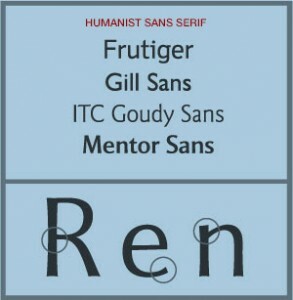 Most Geometric fonts have a single story a.
Characteristics: Humanist typefaces are sans-serif faces that follow the proportions of traditional Roman inscribed capital letters and the Garalde (or Old Style) lower case letters. 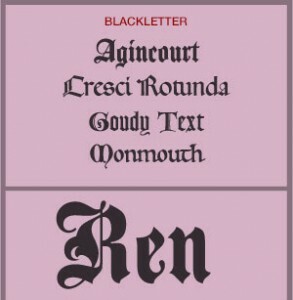 Unlike the monoline geometric fonts they have some contrast between stroke lines and most have a two story a and g.
Characteristics: Typefaces which appear chiselled rather than derived from a calligraphic form. Characteristics: Typefaces which imitate cursive handwriting. 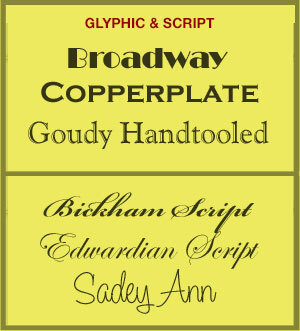 Characteristics: Typefaces based on early manuscript lettering. Blacketter typefaces have dramatic thin and thick strokes, and elaborate swirls on the serifs. Used in the printing of the Gutenberg Bible in 1450. Characteristics: Symbols and typefaces which appear drawn rather than derived from a nibbed pen.